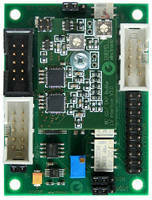 Interface Cards support ultra-low voltage applications. TAP Interface Cards (TIC) TIC02/LV are designed for low- and ultra-low-voltage applications and also support GTL interfaces. They provide externally programmable voltage from 0.5-2 V, which may also be used to actuate GTL/GTL+ interfaces, and input voltage can be regulated from 0-2 V. Connection of TIC to TAP transceiver is differential, promoting safe data transfer over distances up to several meters with TCK frequencies to 80 MHz without any loss of performance. Jena; Las Vegas NV - At the trade fair "APEX" GOEPEL electronic, worldwide leading vendor of JTAG/Boundary Scan solutions compliant with IEEE1149.x announces the launch of the TIC02/LV, two further modules in the revolutionary Boundary Scan hardware platform SCANFLEX® product range. The newly developed TAP Interface Cards (TIC) were specially designed for low-voltage and ultra-low-voltage applications, and also support GTL interfaces. "The trend for the application of low-voltage and ultra-low-voltage signal standards is getting stronger with every new product generation, and requires good support from the system provider," says Raj Puri, US Marketing and Sales Manager with GOEPEL electronic. "With the new TAP Interface Cards we complement our product portfolio in this segment with a flexible and reliable standard solution with extended voltage range. These features guarantee our customers an excellent adaptability to different environments and interface conditions." The TIC02/LV is already the fourth type in the TAP Interface Cards' (TIC) product range, and provides an externally programmable voltage range from 0.5V to 2V with extended power efficiency. Thereby, also GTL/GTL+ interfaces can be actuated. The input voltage can be regulated between 0V and 2V. Beyond that the TIC02/LV-SR offers a galvanic separation of the interface signals via relays. The connection of the new TAP Interface Card to the TAP transceiver is differential, hence an extremely safe data transfer is possible over a distance of several meters with TCK frequencies up to 80MHz. There is no loss of performance due to the TAP-specific compensation of the cables' and UUT's propagation delay by using the ADYCS(TM) technique. In its function as an active test head the TIC02/LV provides a solution for the DC coupled TAP actuation in signal critical or distance critical environments or with multistage signal transfer. This includes especially fixtures for functional tester and In-Circuit-Tester, in which the compact module can be easily integrated. The TIC02/LV is compatible with all SCANFLEX® TAP transceivers of the SFX-TAP(x)/FXT family. For each UUT there are 1 to 8 independent TAP available. The new TAP Interface Cards are fully supported by the leading JTAG/Boundary Scan software SYSTEM CASCON(TM) starting from version 4.4, and are compatible with IEEE1149.1, IEEE1149.4, IEEE1149.6, IEEE1532, JESD71 as well as JTAG emulation. The recognition of the TIC02/LV modules by the software is done automatically using the AutoDetect feature. GOEPEL electronic is a worldwide leading vendor of professional JTAG/Boundary Scan solutions and technology innovator of IP based instrumentation. With more than 100 new product launches over the last five years alone the company established its position as the market's leading innovator. A network of branch offices, distributors, and service partners ensures the global availability of the products as well as the support of the more than 7,000 system installations. Founded 1991 and headquartered in Jena, Germany, GOEPEL electronic has currently about 160 employees and generated a revenue of 19.7 Million Euro in 2008. GOEPEL electronic has continuously been ISO 9001 certified since 1996 and has been honoured with the TOP-JOB award for being one of the best medium-sized companies in Germany. GOEPEL electronic's products won several awards in recent years and are used by the leading companies in telecommunication, automotive, space and avionics, industrial controls, medical technology, and other industries. Further information about the company and its products can be found on the internet at www.goepel.com.